A Few Questions | JD Stockholm. I was asked some general wonderings, too, when I asked what people wanted to know. I guess that these are things I can’t quite cover in the book, so I’ll answer them here. Anything else I might not cover, just ask on my page or here, or message me. 🙂 I try to answer as best as I can. We were friends until I was around 27. I still see him on Facebook, but we don’t talk that much really. He doesn’t live far away. As far as I can see, he is happy. We drifted apart because as my mental health got worse, I started to cancel things and eventually, he stopped asking. I miss him a lot, though. No, aside from Facebook, I don’t see them anymore. I don’t live that far away from where I grew up. Probably just a 15-minute drive. I found therapy useless to be honest. I do better alone. My last one, last year, was pretty bad. He wouldn’t let me talk about anything. He’d say, What does it matter? It’s in the past. And had me down as having low self-esteem issues, which I don’t. I did have CBT for my OCD at one point, but it didn’t cure it, just helped me to calm it a little. I needed that back then. I was living in a bubble. I went to one therapist about my PTSD and the badman. He pretty much accused me of having an overactive imagination and said we’re all afraid of the dark when we’re on our own. So, without therapy, I cope as best as I can. They don’t have a clue. They know little things, like me not having a bed until I was 9, but no, they have no idea really, and I am glad about that. I don’t exactly know why my brother hates my dad so much. I think it’s just a bad relationship and that our father is selfish, and he sees that. They fell out really when my brother asked me lots of questions, like whether my Nan used to beat me, like our parents had claimed. He realised it had all been lies and that made him angry. I don’t think he was abused, but he has issues from living in that house. Maybe he saw things. He was in the same bed as my father and I. He doesn’t live too far away. He comes and goes, but we talk. My older brother lives abroad now; we talk on Facebook. I have other siblings from later in life. My youngest sister is 12. I don’t really have contact with them, though. This entry was posted in Random Thoughts. and tagged abuse, alley kid, amazon, books, child abuse, dear teddy, JD Stockholm, mental-health, OCD, people, PTSD, relationships, sadness, sexual abuse, society, stupid boy, teddy, telling teddy, writing. Bookmark the permalink. Thank you for sharing yourself with us, JD. I hope you know that some people you only know on facebook now care for you very much. I am always here for you! I think, even when you have siblings that are a lot younger than you, you can still have ways of relating to them. But I am guessing that you can’t have much to do with your youngest sister for a reason. I’m so sorry that you didn’t sleep in an actual bed until you were 9. That must have really added to your anxiety and discomfort. 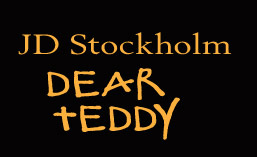 Dear Teddy: Available at Amazon. Telling Teddy: Available at Amazon. How do you fight your brain with your brain?